This is the last race of Urban-Ultra 2018/2019! As part of our Better for You Commitment, we continuously supported Urban-Ultra as we encourage wellness and health in our community! 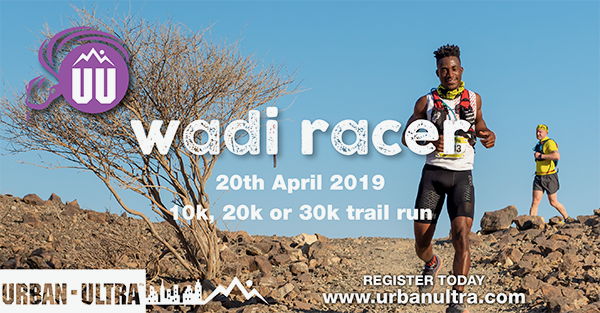 The Urban-Ultra Wadi racer course is a spectacular single track and gravel jeep track as well as rocky wadi bed with short sharp climbs and undulations. It is possible to run this course in both road shoes and trail shoes. The course will be marked with light reflective material for navigation. The single stage 10k, 20k or 30k trail running adventure will start and finish at the Emirates for Adventure and Mountain Tourism Camp at Wadi Showka (25° 6’3.18″N 56° 3’44.24″E) on April 20th 2019. Starting at 5.00am – in darkness! (Just 4km from the original start point – follow their signs from Showka Village). Here you will be racing against the sunrise … racing out into the darkness with a headlamp (not supplied) – terrain is single track trail, gravel jeep track and rocky wadi bed with short sharp climbs and undulations. The course will be marked with light reflective material for navigation until the sun rises and you should cross the finish in the beautiful first light of the day.